Now that there’s a chill in the air, one kitchen appliance is making a reappearance on the counter: the slow cooker. Even if you don’t have one, though, you can still make killer stews with a large stockpot or Dutch oven, combining a bunch of delicious ingredients to make a steaming hot bowl of nutritious comfort food. Home cooking doesn’t get any easier or more rewarding than that. 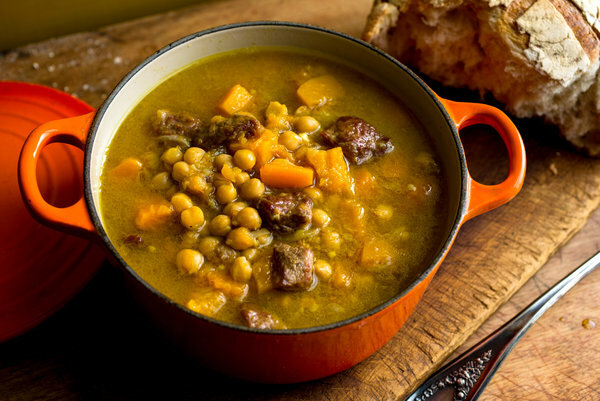 Whether you just need to warm up after a cold commute home, or want to give everyone a reason to gather around the table, one of these 7 healthy stew recipes is sure to do the trick. The word stew tends to conjure memories of juicy beef and tender shredded chicken, but vegetarian stews can be just as satisfying. 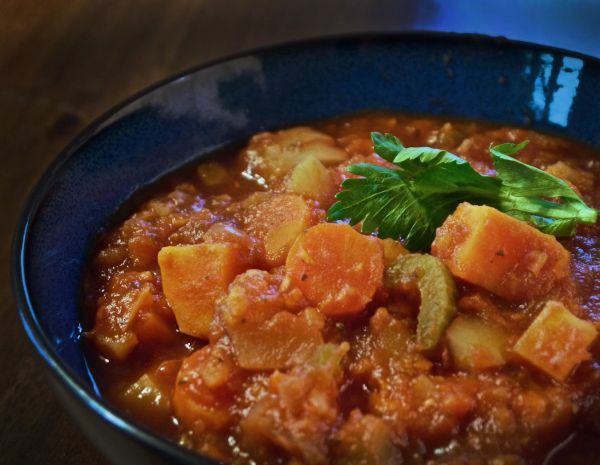 This one, from The America’s Test Kitchen Healthy Family Cookbook, uses the best of the fall veggie harvest to make a rich, flavorful stew that’s every bit as filling as meaty versions — but with fewer calories per serving. 1. Heat 1 tablespoon of the oil in a large Dutch oven over medium heat until shimmering. Add the mushrooms and 1⁄4 teaspoon salt, cover, and cook until the mushrooms are very wet, for about 5 minutes. 2. Uncover and continue to cook until the mushrooms are dry and browned, for 5 to 10 minutes. 3. Add the remaining 1 tablespoon oil, chard stems, onions, celery, carrot, bell pepper and 1⁄2 teaspoon salt, and cook until the vegetables are well browned, for 7 to 10 minutes. 4. Stir in the garlic and thyme and cook until fragrant, for about 30 seconds. Stir in the flour and tomato paste and cook until lightly browned, for about 1 minute. Stir in the wine, scraping up any browned bits, and simmer until nearly evaporated, for about 2 minutes. Stir in the broth, water, potatoes, parsnips, celery root and bay leaves and bring to a simmer. 5. Reduce the heat to medium-low, partially cover, and cook until the stew is thickened and the vegetables are tender, for about 1 hour. Stir in the zucchini and chard leaves and continue to simmer until tender, for 5 to 10 minutes. 6. Discard the bay leaves and stir in the parsley and lemon juice. Season with salt and pepper and serve. One staple of the cold-weather pantry is the sweet potato, and not only because of its namesake natural sugars. 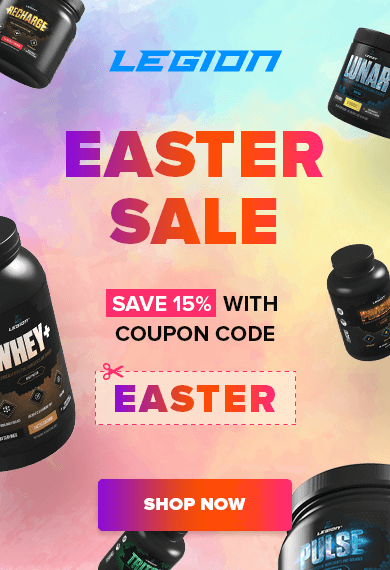 They are an excellent source of complex carbs, vitamins, and antioxidants. When combined with succulent pork as a protein, plus pecans and maple syrup for some extra fall flavor, sweet potatoes make a stew that’s as awesome as it is easy. 1. Place the olive oil in a large sauce pan over medium heat. Add the onion and garlic. Cook, stirring frequently, for about 5 minutes until the onions soften slightly. 2. Add the sweet potatoes, stir and then add the water. Increase the heat to medium high and when the water begins to boil reduce the heat until it is simmering. Cook, stirring occasionally, for about 20 minutes. As the sweet potatoes begin to soften use a spoon or spatula to break them up slightly. 3. Add the parsnips, 1/2 tsp. salt and pepper. Stir, and reduce the heat to medium low. 4. Place a large skillet in the oven, and preheat to 425°F. While the stew is simmering, place a sheet of wax paper on the kitchen counter. 5. Place the pecans in a non-stick skillet over medium-high heat. Cook, stirring frequently, for about 5 minutes. Watch the nuts closely and as they begin to brown reduce the heat to medium. Add the 1/8 tsp. salt. Cook for about one minute more, until the pecans are browned. 6. Add 2 tsp. maple syrup and let it bubble for about ten seconds shaking the pan vigorously to coat the pecans well. Remove the pan from the heat, and stir the pecans. Turn them out of the pan onto the wax paper to cool. Separate them from each other just after placing on the wax paper so that they won’t stick together. 7. When the parsnips are just tender, the stew should be thicker and the sweet potatoes soft. Continue to stir occasionally. 8. When the oven is hot, spray the pan lightly with oil. Add the pork tenderloin, and return the pan to the oven. Cook for about 5 minutes, and then turn the pork. Drizzle the remaining 2 tsp. maple syrup over the tenderloin, and return the pan to the oven. Cook for about 10 minutes more, turning at least once, until the pork is done. 9. Remove the pork from the oven and let stand while dishing up the stew into two bowls. Slice the pork and place it on top of the stew, and then garnish with the candied pecans. Serve. Beef stew? Delicious. Whiskey? Definitely delicious. Put the two together, and you get this incredible stew. In this recipe, simple ingredients add up to big depth of flavor. It’s also easily adaptable, so feel free to try adding a winter vegetable that’s grown locally. 1. Chop the onions and place with the paprika, garlic, and cooking oil in a large saucepan on a low heat. 2. Place the flour, salt, and pepper in a bowl. 3. Cube the steak, and cover in the flour. 4. Brown in a hot pan with a little oil and add to the onions when they have softened. 5. Add the beef stock, slowly at first, and stirring all the time to avoid lumps forming. 6. Add the rest of the ingredients. 7. Cover, and allow to simmer for 2 ½ hours. 8. Garnish with fresh chopped green herbs. 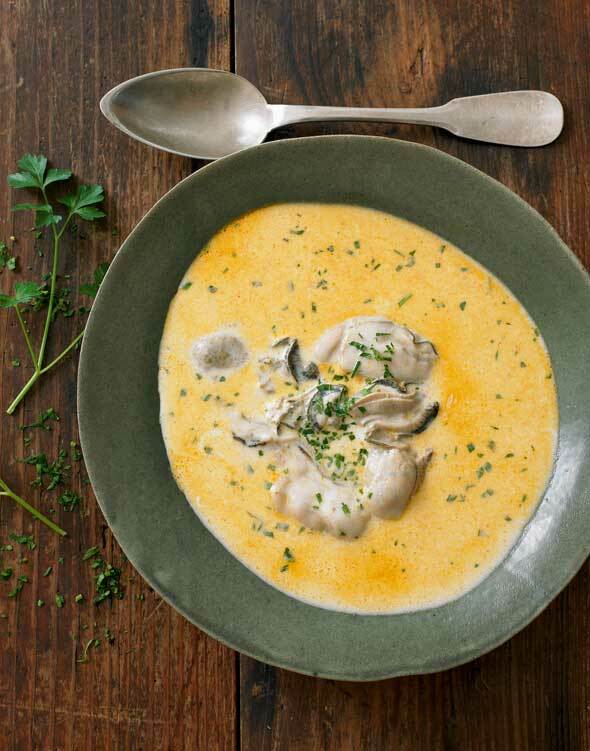 Although oyster stew is often loaded with fat from butter, heavy cream, and sometimes even bacon, it’s possible to pare it down. This version uses whole milk in place of heavy cream as a way to balance out the macros. Of course, you can simply go with half-and-half if you want to the best of both worlds. 1. Drain the oysters through a fine-mesh sieve placed over a small bowl to catch the oyster water. Set the oysters aside. Reserve the liquid. 2. In a medium saucepan, melt the butter over medium heat. Stir in the Worcestershire sauce, paprika, and celery salt. Add the oysters, and bring to a simmer. Cook just until the edges of the oysters curl. 3. Add the oyster liquid to the pan, and return to a simmer. Add the milk and nutmeg, and reduce the heat to low. 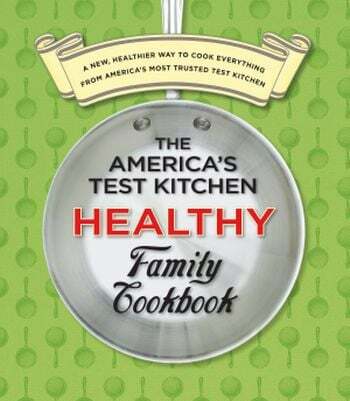 Cook, stirring occasionally, until heated through, but do not let the oyster stew boil. Season to taste with salt and pepper. The combo of noodles and beef is a classic, as in dishes like spaghetti and meatballs. 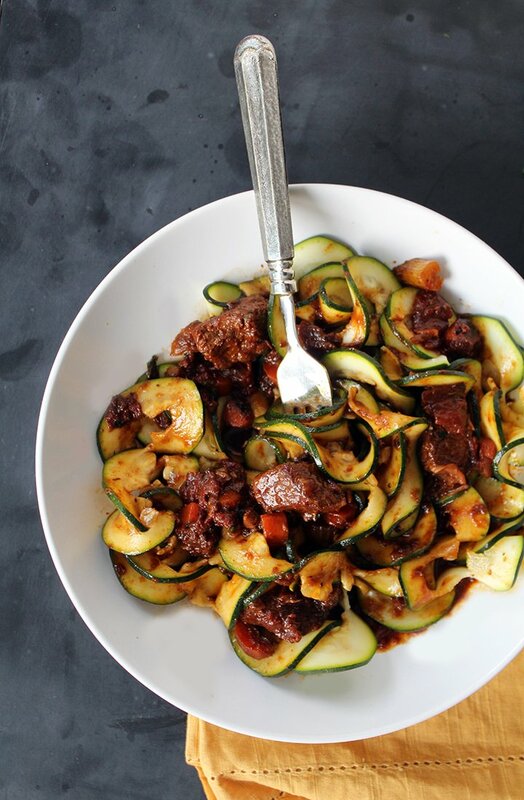 But this recipe offers a totally different take with zucchini noodles and hearty beef stew. If you don’t have a spiral slicer to prepare the zucchini, use a vegetable peeler, mandoline, or a large box grater. 1. Place a large saucepan over medium heat, and add the olive oil. Add the beef chunks, and cook until browned. Remove from the saucepan, and set aside in a bowl. 2. In the juices left in the pan from the beef, add in the garlic to cook for 30 seconds. Then, add in the red onions and red pepper flakes. Cook for 1 minute, and then add in the celery and carrots. Cook for 2 minutes to let the vegetables sweat, and then add back in the beef chunks. 3. Add the Worcestershire sauce, thyme, and cayenne pepper, stirring to combine. Then season with salt and pepper, and add in the beef broth and diced tomatoes. Place the bay leaves on top, and cover to bring to a boil. 4. Once brought to a boil, lower to a simmer, and cook covered for 40 minutes. Then, let simmer uncovered for 35 more minutes, until the stew thickens. 5. Divide the zucchini noodles into bowls, and evenly divide the stew to spoon over top. Let the warm stew cook the noodles for a couple minutes, garnish with fresh parsley, and dig in! 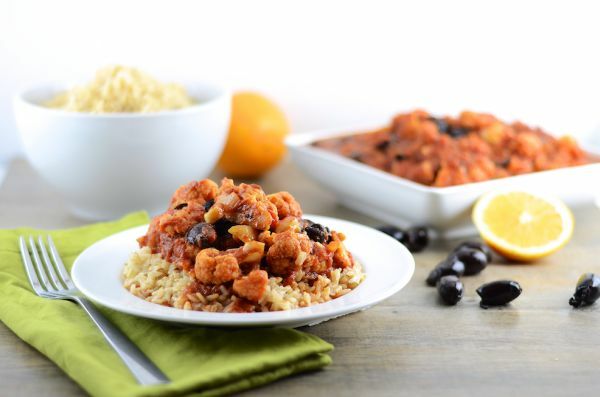 Some stews are great for dinner as is, but others are better with a base like rice, quinoa, or couscous. The flavors of this stewed cauliflower — with Greek ingredients like oregano, celery seed, and Kalamata olives — soak into any grain or similar side to make a uniquely satisfying meal. To boost the protein, keep it simple with baked lemon chicken or pan-seared white fish. 1. In a large stockpot, add the oil. Once heated, cook the garlic and shallot until softened. 2. Add the cauliflower, orange zest, cinnamon, tomatoes, oregano, celery seed, and pepper flakes. 3. Add a lid and cook on low until the cauliflower is tender, about 15 minutes. 4. Stir in the olives. Season with salt and pepper to taste, and serve with rice. This stew takes patience, but it’s easy to put together. 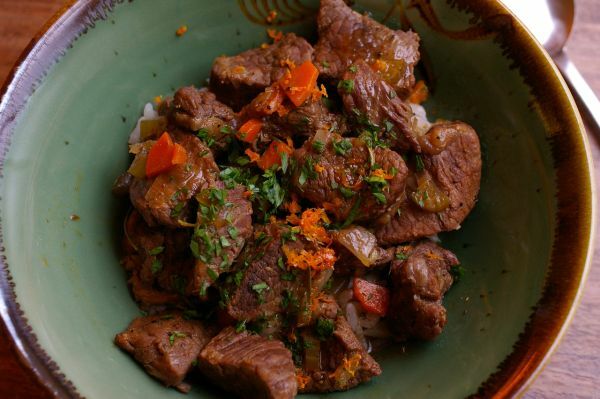 As long as you wait for the lamb to become unbelievably tender and the flavors of cumin, cardamom, and coriander to develop, you will be rewarded with a soulful stew that belongs as much in a chef’s kitchen as it does at a family table. 1. Combine the spices and salt in a bowl. In a large bowl, stir together 1/4 cup flour and 1 1/2 teaspoons of the spice mixture, add the lamb and coat well. Heat 3 teaspoons of oil in a large pot. Add lamb a few pieces at a time; don’t overcrowd. Turn the pieces until lamb is browned on all sides, about 5 minutes per batch; add a teaspoon of oil as needed between batches. 3. Stir 3 tablespoons of the cooking liquid into 2 tablespoons of flour to make a smooth paste. Stir the paste into the stew and cook until the broth thickens and the squash is tender, about 10 minutes longer. Add salt and pepper to taste. Divide among six bowls, garnish with cilantro, and serve. 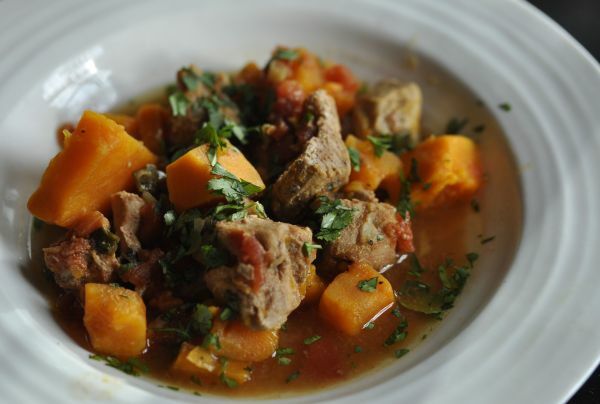 What did you think of these healthy stew recipes? Have anything else to share? Let me know in the comments below!